Original Editors - Michael Thompson as part of the from Bellarmine University's Pathophysiology of Complex Patient Problems project. Bipolar disorder, also known as manic-depressive illness, is a disorder that deals with the human brain. The brain causes unusual shifts in mood, liveliness, activity levels, and the ability to carry out daily activities. People that suffer from this disease can experience mood swings that occur as few as a couples times throughout a year or up to multiple times within a day. The Depression and Bipolar Support Alliance has estimated that close to 6 million Americans are affected by bipolar disorder every year. Bipolar disorder can affect anyone at any age and is found in all races, ethnic groups and social classes with the typical onset being 25 years old. Patients may be diagnosed in their early childhood to as late as the 4th and 5th decades of life. Bipolar disorder is not gender based and can affect men and women equally. Although, studies have shown that women with Bipolar disorder have more depressive and mixed episodes than men with the disorder. More than 66% of people diagnosed with Bipolar disorder have at least one primary family member with the illness. The incidence of Bipolar disorder in other countries is notable as well. In Australia it is approximately 238,957 people, in the United Kingdom it is approximately 723,248 people, in Germany it is approximately 989,095 people, in Canada it is approximately 390,094 people, in Iran it is approximately 810,038 people and for both India and China it is approximately 12-15 million people. o Behaving impulsively and taking part in many pleasurable high-risk behaviors. o Thinking of death or sudicide or attempting suicide. These co-morbidities range from mental health disease all the way to physical system disorders. "Comorbidity in Bipolar disorder; the complexity of diagnosis and treatment" reports that there are three main mental health co-morbidities associated with Bipolar disorder; anxiety, attention deficit/hyperactivity disorder and substance abuse. Anxiety is defined as a feeling of apprehension which results in physical symptoms during certain periods of a person's life. "In the Systematic Treatment Enhancement Program for Bipolar Disorder (STEP-BD), lifetime prevalence for a comorbid anxiety disorder affected 51.2% patients with BPD." STEP-BD reports that patient with bipolar disorder are at a higher risk for many different types of anxiety disorder such as simple phobia, social phobia, obsessive-compulsive disorder and most prominent being panic disorder. "Of these, panic disorder appears to have the highest risk of comorbidity." Another co-morbiditiy that can be associated with bipolar disorder is attention deficit disorder/hyperactivity disorder which can be characterized as short attention spasm with difficulty sitting in one place for long periods of time or focusing on one task. When ADHD is overlapped with bipolar disorder many people can present with different symptoms than ADHD include irritability, impulsivity, distractibility, overactivity, rapid speech, and emotional lability. These symptoms can be associated with multiple disorders and no good diagnostic tool has been created to true understand the affects of these two disease have on each other. "The co-morbiditiy of substance abuse was found to exist in 61% of patients with bipolar disease. Research from the Stanley Foundation Bipolar Network found that the lifetime prevalence rate of alcohol abuse or dependence was 49% for bipolar men and 29% for bipolar women. Women with BPD seemed to be at higher risk for alcoholism than women in the general population." Many different types of substance abuse have been seen in people with bipolar disorder that range from alcohol use to street drugs to prescription narcotics. Associated medical co-morbidities include but not limited to cardiovascular disease, type two DM, and endocrine disorders. There are many medications that a physician may prescribe to a patient diagnosed with Bipolar disorder. One of the most popular medications that is prescribed is Lithium. It is a mood stabilizing drug and has been shown to significantly reduce the amount of hospitalizations in patients with Bipolar disorder. It has an effectiveness of up to 80% on all hypomanic and manic episodes. Valproate and Carbamazepine are the first and second most used anti-epileptic medications by many Bipolar disorder patients. These medications work well in treating symptoms such as mania, rapid-cycling and mixed states. Atypical antipsychotics, which are typically used to treat schizophrenia, have been proven to help in the treatment of Bipolar disorder. These include Clozapine, Olanzapine, Risperidone, Quetiapine, Aripiprazole and Ziprasidone. Since patients with Bipolar disorder typically have depression, they will at times be treated with anti-depressants. Although, anti-depressants have been shown to cause mania in 10-30% of patients. Anti-depressants typically prescribed for these patients are Bupropion, Fluoxetine, Citalopram, Sertraline and Proxetine. There are no diagnostic tests, imaging studies or lab values that are able to accurately diagnose bipolar disorder. The best way to figure out if a patient has bipolar disorder is to talk with a physician about mood swings, behaviors and lifestyle habits. The physician must hear from the patient about their bipolar signs and symptoms in order to effectively diagnose and treat bipolar disorder. It is unknown at this point what actually causes bipolar disorder, but there have been studies done that try and link the disorder with various situations and events. Experts believe that bipolar disorder often runs in families, and there is a genetic component to this mood disorder. There is also growing evidence that environment and lifestyle issues have an effect on the disorder's severity. Studies that were conducted at Stanford University found that children with at least one biological parent who has bipolar disorder have an increased likelihood of getting the disorder. The researchers in this study concluded that of the offspring in this study, 51% were diagnosed with some type of psychiatric disorder. The most prevalent disorders that the offspring were diagnosed with was major depression, dysthymia (mild depression), bipolar disorder or attention-deficit/hyperactivity disorder. Children with bipolar parents may live in an environment that is unhealthy, and possibly predispose the child/children to develop signs and symptoms of bipolar disorder if the parent(s) do not take the correct steps to treat their disorder. The children's environmental stressors may consist of their parent's unpredictable mood swings, alcohol or substance abuse, financial and sexual indiscretions and hospitalizations. A research study taken from the September 2008 issue of Archives of Psychiatry suggested that children born to older fathers are at an increased risk for developing bipolar disorder. Researchers reported that children born to fathers in their mid 50's and older were found to have a 37% higher risk for bipolar disorder than children born to dads in their early 20's. Bipolar disorder may affect multiple systems in the body due to the various medications that a patient may be prescribed. Obesity, diabetes mellitus, heart disease and stroke are a few of the more common medical conditions that can affect various bodily systems. In February 2009, the medical journal Psychiatric Services published findings showing that bipolar disorder can DOUBLE your risk of early death from a range of medical conditions - including those that can be controlled through diet and exercise. 1. 35% of people with bipolar disorder are obese? This is the highest percentage for any psychiatric illness. 2. People with bipolar disorder are 3 times more likely to develop diabetes than are members of the general population. 3. People with bipolar disorder are 1.5 - 2 times more likely to die from conditions such as heart disease, diabetes and stroke. There is a wide variety of medications that may be used to treat people with bipolar disorder. These medications can be found above in the Medications section. Along with medications, patients are frequently seen by Psychologists so that they may have a medical professional to talk to, not only about their condition, but also someone to confide in and help them manage their disorder. Psychotherapy is also an important addition to drug treatment. Therapy that includes the entire family is important. Patients with bipolar disorder are primarily treated by physicians, who prescribe medications, and psychologists. Both of these types of treatment methods are outside of the physical therapist's scope of practice. So ideally there is not much physical therapy management that goes into treating these patients. However, physical therapists may assist these patients with the various complications of the disorder. Since these patients are at a higher risk of suffering from obesity, diabetes mellitus, heart disease and stroke, physical therapists may play a significant role in helping these patients manage these conditions. Physical therapists can provide these patients with education and various exercise programs to assist them in achieving optimum quality of life. A type of alternative treatment for bipolar disorder is electroconvulsive therapy, more commonly known as shock therapy. Electroconvulsive therapy (ECT) is a non-drug treatment for bipolar disease and other mental disorders, such as severe depression. ↑ National Institute of Mental Health. Health topics: bipolar disease. http://www.nimh.nih.gov/health/publications/bipolar-disorder/what-is-bipolar-disorder.shtml (accessed 16 March 2011). ↑ Depression and Bipolar Support Alliance. Bipolar disorder statistics. http://www.dbsalliance.org/site/PageServer?pagename=about_statistics_bipolar (accessed 17 March 2011). ↑ 3.0 3.1 3.2 3.3 3.4 Bipolar-Lives. Bipolar disorder statistics. http://www.bipolar-lives.com/bipolar-disorder-statistics.html (accessed 17 March 2011). ↑ National Institute of Mental Health. 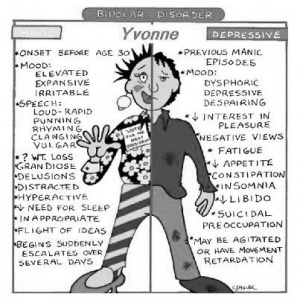 What are the symptoms of bipolar disorder? http://www.nimh.nih.gov/health/publications/bipolar-disorder/what-are-the-symptoms-of-bipolar-disorder.shtml (accessed 17 March 2011). ↑ 5.0 5.1 5.2 5.3 5.4 5.5 Sagman D, Tohen M. Comorbidity in bipolar disorder the complexity of diagnosis and treatment. Psychiatric times 2009;26:4. http://www.psychiatrictimes.com/bipolar-disorder/content/article/10168/1391541?pageNumber=3 (accessed 17 March 2011). ↑ Mental Health Disorders. Anxiety. http://www.medterms.com/script/main/art.asp?articlekey=9947 (accessed 17 March 2011). ↑ 7.0 7.1 7.2 7.3 7.4 7.5 University of Maryland Medical Center, Bipolar Disorder-Medications. http://www.umm.edu/patiented/articles/what_psychologic_lifestyle_approaches_bipolar_disorder_000066_9.htm (accessed 17 March 2011). ↑ WebMD. Bipolar disorder guide: bipolar diagnosis. http://www.webmd.com/bipolar-disorder/guide/bipolar-disorder-diagnosis (accessed 1 April 2011). ↑ 9.0 9.1 9.2 9.3 9.4 WebMD. Bipolar disorder guide: causes of bipolar disorder. http://www.webmd.com/bipolar-disorder/guide/bipolar-disorder-causes (accessed 1 April 2011). ↑ Bipolar Disorder Today. Bipolar disorder. http://www.mental-health-today.com/bp/bi1.htm (accessed 5 April 2011).